Where is the best source for reproduction hubcaps for Hayes demountable rim wire wheels? Good Luck I had several sets from a fellow in Calif and he said that's all! Someone needs to run a batch. If so, I'm in for a set. There is a place in Australia who reproduces them. They are cast brass and quite a bit heavier than the original. You will need to nickle plate them if they are to look original. I bought a couple a few years ago and they were very good quality. How about a source for locking Buffalo hubcaps? Excellent reproduction Hayes hubcaps are available from Vintage and Classic Reproductions in Queensland Australia. 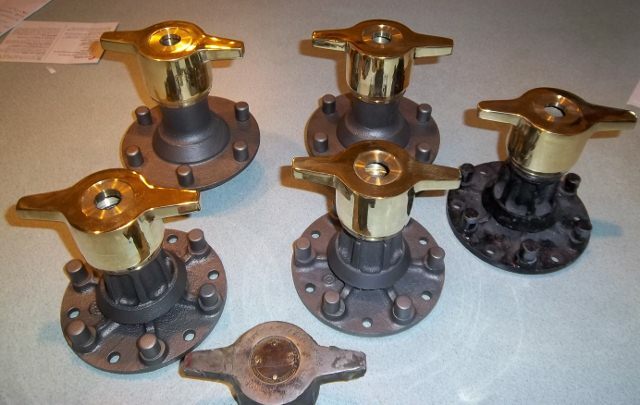 These are lost wax castings of high quality. They are axact duplicates of the originals, not heavier sand cast roughies. Brass is no longer permitted in Australian foundries, so the alloy used is a little redder than brass. However, nickel plated as original, and no one will know. Just got through doing this set of Dayton knock offs plus I have done the locking style in the past and have also done both the knock off style as well as the locking style for the Buffalo wheels. I have a Hayes cap now to reproduce but it has Jackson, Michigan rather USA under the Hayes name if I remember correctly since I don't have it in hand at the moment. I personally feel as long as some one out there is making these and doing a good job then I can go on to other projects. If $15 or $20 savings is going to prevents a purchase from this guy so be it. If the average guy knew the time it involves to reproduce a one off project like these Hayes cap his $90 price wouldn't seem too high. originals that don't have the small writing buffed away by a previous "restorer" are tough to find....... i probably went through two dozen over a 2 year period to get a nice set. even now, my spare cap is perfect original except for a bullet hole in it, that came out of australia. i love it ! $90 for a lost wax casting is a bargain, and that is the only way to go. a sand casting would not pick up the needed detail. I forgot to mention that some original hubcaps which fit Hayes wire wheels have turned up in Australia with no brand at all on the end. It is plain flat right across, not even a ridge around the edge of the octagon. I have a nickel plated one in my swap meet stock if anyone is interested.